The overall size of this painting is 16" x 20". The medium is acrylics. 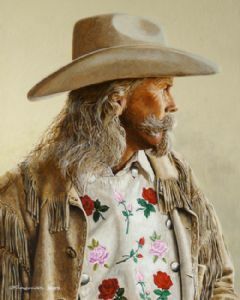 Description: Portrayed here, Alan Baker of Cody, Wyoming in character as a middle-aged, William "Buffalo Bill" Cody. This study was the first of many photos taken of Alan for this portraiture. The greatest thing about this photo, it was totally "candid," taken on the veranda of Buffalo Bill's historical hotel, "The Irma," named for his daughter. Baker was waiting patiently for his turn to play his part in the 2004 "Cody Gunfighters" re-enactment when Denny's wife, Leigh, framed this fantastic millisecond in time. Original is for sale $5000.